French Armoires…More Than Just a Closet. In the past, Armoires were usually relegated to the bedroom of the house. In France, they’re still used just about everywhere you go. Of course, France is saturated with character homes that can date back several centuries still with the original furnishings intact. You’re guaranteed one of these beautiful Armoires in every bedroom of these residences if they were built before the 20th Century. Typical South of France Maison. But Armoires in France aren’t restricted to houses or bedrooms. In French homes you’ll see Armoires used in any room where storage and decorative appeal is required. Like this photo below of an elegant Parisian apartment. Not only does it provide much needed storage but the decorative element is undeniable. (I also LOVE the floors). The beautiful white distressed Louis XV style Armoire is not only decorative but a wonderful storage unit. We sell many Armoires at the Antique Warehouse. Here in North America, buy a home or apartment and you’re almost guaranteed a built in closet. It may be the size of a postage stamp, but a newly constructed residence will always have one. Although closets could occasionally be found in North America, they didn’t come into common use until after World War II. Today they’re viewed as a basic necessity, like indoor plumbing, and it can be quite a nuisance if you’re in an old house that’s missing one. Not only do french armoires provide capacious storage and fantastic versatility, but their design impact is just what’s needed when you want to add some elegance and interest to an otherwise characterless room. A painted French armoire can give a lightness and a focal point of interest in any modern construction. Not only does an armoire provide storage, but it’s a high-impact decorating tool. Although armoires were originally used in the 16th century for storing weapons (thus the name armoire, from the old French armarie), by the 17th century their use was expanded to include the storage of clothing and linens. This exemplary old French version is used classically in a bedroom. Its imposing presence grabs your attention and sets the tone. This beautiful Louis XV painted armoire is one of the nicest designs around. 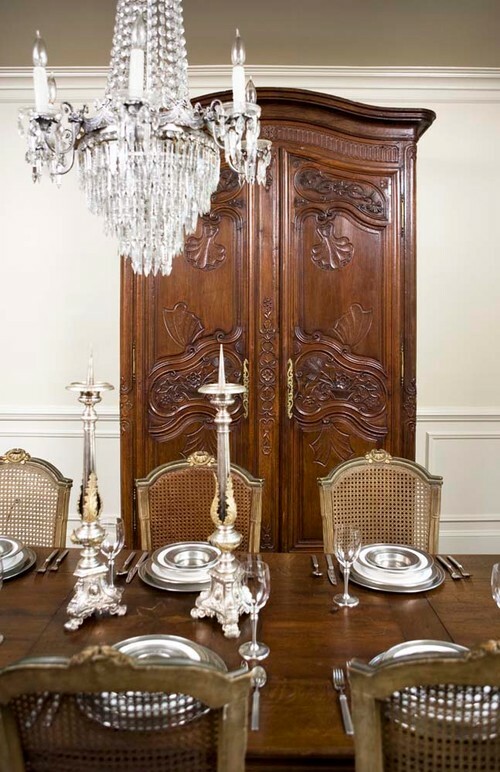 And speaking of setting the tone, the elegant and ornately carved French Armoire can look sensational in a dining room. Paired with a French crystal chandelier the look creates a refined atmosphere that would make any hostess feel like she’s entertaining in Paris. You can put anything in those armoires, be it table linens, a bar, collections of dishes and crystal, a stereo playing cool jazz, classical or cool ambient tehcno. One of the nice things about these elegant pieces of furniture is that they are usually made to completely disassemble. (not always the case with Armoires from England) The doors lift easily off the hinges, the crown and base are usually separate pieces, and the sides and back will come apart in many sections. the Empire armoire the man is taking apart for shipment to us will completely disassemble into about 10 or more pieces. You can see another armoire Louis XV in the background almost completely apart. Small Armoires look wonderful in the bathroom and provide much needed storage space. Elements of Armoires can be used for a multitude of purposes. I personally took the doors off one armoire and replaced regular boring closet doors in an entry way in my home with a pair of walnut Louis XV doors. The look is fabulous and everyone remarks on their beauty. I didn’t refinish them either preferring to the leave the rich tonal qualities of the highly french polished walnut. I found the below photo on the internet where a contractor had taken an armoire or buffet or French cabinet and created ‘cabinet facings’ in a kitchen. (see below). The look is splendid and rich! Imagine the cost if you tried to have this custom made today. In another example of adaptability, here an antique armoire has been expertly incorporated into bedroom closet storage. It definitely adds warmth and character. Look how much storage these armoires have. I’ve even retrofitted these pieces to fit big screen TV’s. This particular designer reversed the placement of the doors so they remain open and the decorative ‘fronts’ remain exposed. Look how interesting this Louis XIII walnut armoire looks in this modern environment. There’s no beams, crown mouldings, or chandeliers in this space. The interest and charm is created by the use of a few antiques. Clearly armoires, be they French, English, Spanish or otherwise clearly have a multitude of uses. The idea is to decide where you’d like to incorporate these wonderful pieces into your home. Visit us in person or online and see the selection we carry here at The Antique Warehouse Vancouver. We ship anywhere! Should I Reupholster or Buy a New Sofa? That all depends if you purchased a quality sofa to begin with! According to Suzanne Dimma, editor in chief of House and Home Magazine, investing in the best sofa you can is her advice. If you invest early in the best, a sofa can be recovered for years and years to come. “Invest in the best and start early. I still have the same sofa I bought for my first house. I chose one that was well built and the design I knew would be timeless. I’ve even had it re-upholstered time and time again, and still love it” says the doyenne of style. If your sofa wasn’t all that great to begin with, consider buying a vintage or antique piece. The quality (particularly the European made) is usually superior to anything made today. From the construction, to the detailing, vintage pieces excel in almost every area. And lets face it, when you recover, you get exactly what you want. So start with good bones, and consider a vintage or antique piece. How much fabric will you need? Here’s a guide below that can help you predetermine that. A sofa from 76″ – 84″ Wide will need approximately 16 – 20 yards of fabric. This Classic Louis XVI French made sofa is timeless in design and when recovered will last for years and years to come. C.1930, the detailing is gorgeous (something you won’t find on a new piece) and will cost less than a new sofa. This piece will probably need around 12 – 15 yards of fabric. Imagine this lovely fabric on this classic Louis XVI Settee. Elegant and modern. For chairs, here’s some quick figures to help you out. A wing back like this French Louis XVI style chair will require about 6 – 7 yards. This chair, while almost 60 years old is a style that’s copied and manufactured today. You can buy this chair for less than $500! It will take probably 5 – 6 yards. One of the French Empire Chairs C.1800 will require 4 yards. Times that by 2 for the pair. They’ve last over 150 years now. They’ll be good to go for another 150. (Everything above is available at the Antique Warehouse). If you don’t see what you’re looking for, remember not everything in our 12,000 sq.ft. store is online. You can also sign up for our weekly acquisitions. You’ll never know what’s coming down the pike. This is Mark LaFleur signing off from beautiful Vancouver, British Columbia. You’re seriously going to paint your Antiques? Yes, folks. People are now painting their antiques at breakneck speed. White seems to be the color du jour, but already that look is tiring quickly. While most Antiques lovers consider painting an antique a sacrilege, I’m a little less of a puritan than that. If that’s what you want, then go right ahead. But consider reading my blog carefully before lifting that paint brush! Believe it or not, some antiques actually do look better when painted. I examine each piece on a case by case scenario before deciding to paint or not. These are the factors I consider! 1. How old is the antique? If it’s 50 years old or less than it’s usually a good candidate for a lick of paint. However, a 100 yr old broken down French Antique Henri II piece could be painted. And look quite wonderful too. These pieces are usually made of Oak, and oak takes paint nicely. 2. How valuable is the antique? I wouldn’t paint any antique I paid a lot for. We have lots of pieces in our store that are cheap and cheerful and would look amazing with a coat of ‘antique french white’. In fact a cheap antique once painted can double in value if done right. You wouldn’t believe how many people come in and purchase an expensive antique and then announce they are painting the thing! It happens way too much and I always suggest a less expensive alternative. 3. What is the design of the antique? If the design of the antique is quite linear and is dependant on the veneering or inlays for the design than painting such a piece may disappoint. I have found that an antique with lots of carving is the best candidate for paint. The carving ‘pops’ when painted and looks sensational. Like the antique Henri II piece I mentioned above. An antique like this buffet hutch on the left, while it a shame to paint, would take a coat of paint quite nicely and change the appearance dramatically. All the carving and detail would literally ‘pop’ off this antique! We recently painted a lovely early 20th Century antique French Commode with simple lines but veneered with lots of exotic and rare woods. I wouldn’t have painted this antique for the world, but the client wanted it. Because the design of the antique was simple the piece ended up looking less exciting than a highly carved antique. This was a mistake as far as I am concerned but the client was thrilled. And I was happy he was satisfied. 4. How interested are you in reselling or handing down the antique in later years. You should know that once a good antique has been painted, that’s virtually the end of the line for the piece. That’s why I highly discourage anyone from doing anything to a higher end antique. So many lower priced alternatives are out there. Once paint has been applied to the antique the original patina of the piece is obviously gone, but even if you change your mind months or years later and decide to restore the finish you will never regain the original patina of the antique. You can NEVER restore an original patina that took years of oxidation to develop. Consider the wood of the antique? If the antique is a beautiful piece of Mahogany made furniture, paint it if you want, but consider this…..you will NEVER be able to change your mind and get the original finish back. You could get something close, but it will cost hundreds maybe thousands of dollars to restore a mahogany finish that would please you. Is the original finish shot? If it’s a very old antique and the finish is completely gone, than a painted finish could do the trick. It’s going to need refinishing anyway, so painting may be a reasonable alternative. We had a 19th Century French antique games table with a completely ruined finish. Every square inch of the piece needed refinishing. It would have taken hours, and frankly, wasn’t really worth it. We painted it a matte black ( it was mahogany too ) and it sold within days. It was gorgeous! However, this is a story that sickens! We had a client who bought an absolutely gorgeous burled walnut veneered antique bookcase/china cabinet that she paid a lot for. The piece was an early English 20th Century high end piece with a patina to die for. We almost choked when the client told us she was painting it white. I suggested maybe select something else, but no, this client was insistent. And so it went, this absolutely stunning antique China Cabinet, to the painters. That was sad. I also had a client who was nuts about silver. She silver leafed everything. She bought a beautiful 19th Century antique French Settee with it’s original walnut patina. It was gorgeous and expensive with beautiful detail and carving. She told me she was going to ‘silver leaf’ the thing and I shuddered with disbelief. Hey I’m in the business of selling antique furniture, so if someone wants to silver leaf an antique period Louis XV piece than go right ahead. It’s sacrilege in my opinion and I’d love to say I won’t sell you the piece. But business is business and I wouldn’t be open for long if I started shoving my values down people’s throats. I ALWAYS recommend another alternative but if a client is insistent than what can I do. Thankfully this client decided against painting the piece! I sighed a deep breath of relief when she told me she took my advice. Good thing too…because three years later the lady had to resell her antique. She got almost full value because she hadn’t touched the integrity of this fine 19th Century antique! So my advice about painting Antiques. I wouldn’t unless it’s something you feel would look better painted. If you need advice in this area contact us first for a final evaluation. We will definitely help stave off a mistake you may regret down the road! It’s amazing how many phone calls I get from people wanting to know how to strip their antique furniture because the finish is damaged in some way. After a brief discussion with the person we can sometimes determine that a total strip and refinish may not be necessary at all. Some expert touch and minor repair up is all that’s required. If the original finish is damaged and beyond redemption, than stripping may be your last resort. In this week’s blog we’ll explore how to determine whether a total ‘strip’ is required or not. We’ve all heard experts tell us daily, altering the finish can destroy the furnitures value. In most cases this is true. For example, a 17th Century hand painted finish on a rare American or Continental piece can spell disaster if stripped. People hunt and pay dearly for those ‘distressed’ finishes that were done by hand over 250 years ago. They are rare and should never be touched, other than with a light cleaning. And even a cleaning can be touchy unless you know what your doing. We’ve also heard of the person ‘cleaning’ or ‘polishing’ up a piece of furniture and completely destroying the original patina and devaluing the piece many thousands of dollars in some cases. This is true in more cases than not. Then there are the people that decide they want to refinish a lovely old piece to make it look ‘better’. I see wonderful tables that come in to my store, where the client has totally refinished the piece. The original color, depth and patina has been destroyed, devaluating the piece to a fraction of what it might have fetched. Many finishes that look absolutely horrible may be salvageable with a little oil and wax. It’s amazing what we do with pieces that come in from France that look like deaths’ door and after a little TLC they end up looking wonderful. I would only strip a piece of furniture if the following applies. B. The finish has chipped off in some way over the entire surface. C. The finish has deep cigarette burns or fire burns. D. You want a different color. I would suggest either contacting us first, or sending a photo and we can let you know whether a little touch up will do the trick or if a complete ‘refinish’ or ‘restoration’ is necessary. If you notice I have used the word ‘restoration’. We do much restoration to finishes without totally stripping a piece. This keeps the integrity of the piece intact, and leaves the original finish which is always preferable. If you’ve scrutinized the finish and determined it’s beyond help, you may want to strip and refinish the piece. Another prime candidate for stripping and refinishing is a piece that was originally finished in a wood finish but has since been painted over within the last 50 years. Usually you’ll find that the paint was applied directly over the original finish, making it easier to strip because the paint pigments have not been able to penetrate the wood grain. Stripping and refinishing this kind of piece often exposes beautiful wood hidden under an opaque finish. Keep in mind, however, that some pieces were made to be painted; stripping them usually uncovers inferior or mismatched wood pieces that will not finish well. If the paint has been applied to raw wood, it’s usually an indication that the piece was meant to have a painted finish. In such cases you may still want to strip furniture paint to repaint the piece, or you may be able to simply repaint over the old color. To find out whether the paint is directly on the wood surface or atop another finish, scrape the paint or apply solvent to it in a small, inconspicuous area. If the paint pigment remains in the wood grain, it was probably painted originally; if not, the paint is over a natural wood finish and refinishing may be in order. You may want to consider joining one of our French painting classes held at the store and conducted by painting guru Kathy Van Gogh. She will show you how to produce a ‘faux finish’ that will look many decades old. Another case for stripping is if the finish is so far gone or damaged that it simply cannot be renewed. Old finishes can become brittle or flaky as a result of age and mistreatment. Finishes can also be damaged by water or fire and often can’t be restored without stripping and refinishing. Water can make some finishes lift and discolor permanently, while heat and smoke can blister or blacken finishes. Yet another reason to strip and refinish a piece: You don’t like the finish color or shade. For example, if you’re putting a piece in a particular room or with another piece of furniture, you may want to blend or match the room’s other furniture or the area’s decor. But again, before deciding, consider the piece itself: If it’s a valuable piece blessed with an original finish, you’d be better off saving the finish and buying another piece of furniture to fill your need! To me it’s like buying a piece of artwork to match the color combination of a room and not for the artworks sake itself. Remember, it’s easy to strip a piece ( with a lot of elbow grease involved ) but it’s quite another to ‘refinish’ the piece. There are so many types of finishes to choose from that it can be daunting. But I can almost guarantee you, unless you’re a pro you may regret ever trying to refinish a piece yourself. This is where you definitely need to consult a refinisher. And even then, there are good and bad refinishers. I know of one who simply sprays a lacquer finish on pieces. So many times, more often than not, I see this done to furniture. The look is dull, flat and plastic. I hate this finish, unless its a super high gloss clear coat on an art deco piece or something very modern. And be careful about putting a high gloss clear coat on an antique. The look is simply awful. The antique looks too new, and looks like it should be in the showroom of an Ethan Allen or some other new furniture vendor. Dont do it!! It will devalue and ruin the piece for ever. My advice, go ahead a strip the piece if you want, but let a professional apply the final finish unless you are truly confident you know what you’re doing. It’s Christmas Time. The most wonderful time of the year. I personally love Christmas and getting together with friends and family. This is also the season for candles. And lots of them. Either on your beautiful dining table to create a warm and charming ambience, or placed throughout the home infusing holiday scents into the air. Whichever it is, candle wax can get on furniture. And removing it can damage your antique furniture if you’re not careful. The first thing to remember that candle wax must be left to harden before attempting any removal of any kind. Follow these simple steps outlined below and removal will be problem free. Tools and Materials you’ll need. Use an ice cube to harden the wax drippings, making them brittle. Use a plastic paint scraper or the edge of a credit card to scrape all the wax from the furniture finish surface as gently as possible. Apply a cream polish to the furniture surface using #0000 steel wool. Rub with the grain of the wood; this will remove any remaining wax residue. Buff the repair area to a luster similar to that of the surrounding finish using a soft cotton cloth. Please note, that neither I nor the Antique Warehouse accept any responsibility if you damage your furniture. This blog is meant as a suggestion only. The upcoming blogs are going to be about the care, restoration or repair of your precious antiques. While it’s always best to let a professional handle these delicate matters, these blogs should answer some questions about whether a piece is salvageable or ready for donation to your local thrift store. Water and other kinds of liquid can cause ring stains in finish and wood. Shellac finishes are more susceptible to this problem than other types. Stains that are in the finish are usually white, while stains that have gone through the finish and into the wood will appear dark or black. Dark water stains can’t be removed without refinishing, and even then, they are difficult to get out. You may be able to remove the finish, bleach the stain, and refinish the surface. White water stains, or those still in the finish, can often be removed without stripping the finish. The longer the stain is in the finish, the deeper it will penetrate into the surface. The deeper moisture penetrates into the surface, the harder the stain is to remove, so it’s important to remove water stains as soon as possible. Finish discoloration that’s caused by moisture is a result of moisture being trapped in or under the finish. To remove water stains, you must get rid of the trapped moisture. This can be done in one of two ways: Use a chemical called an amalgamator to soften the finish long enough for moisture to evaporate before the finish hardens, or use an abrasive to cut into the finish to the depth of the moisture, allowing moisture to escape and causing the stain to disappear. Amalgamator is an alcohol-based mixture sold by finish and touch-up supply stores to soften an area of the finish and cause the moisture stain to dissipate. The technique for applying the amalgamator to the finish surface is similar to that used for French polishing. If you can’t get amalgamator, try using denatured alcohol instead, but be careful not to cut too deeply into the finish. Use a soft cotton rag to make an applicator pad. Ball or roll up the rag in a comfortable size to hold in one hand (about the size of a large egg). Smooth out the part of the rag that will make contact with the finish surface. There should be no wrinkles or creases. Apply amalgamator to the pad, allowing it to soak into the rag. Tap the padding rag into the palm of your other hand, causing the amalgamator to spread into the rag until the surface of the rag is damp, but not wet. Pad over the surface of the finish on top of the stain with a pendulum-like stroke in the direction of the wood grain. Briefly touch the padding rag to the stain surface, and then lift it off, keeping the pad in motion when it’s in contact with the finish surface. The water stain may not immediately disappear, so continue to pad the area, adding more amalgamator to the rag if necessary. The trick is to keep your padding rag damp enough to soften the finish but not wet enough to cut through the finish to the wood surface. When you finished to remove the water stains, allow the area to dry. Next, rub the finish down with #0000 steel wool to blend the sheen. Paste-wax the finish if necessary. You can use any of a number of fine abrasives to remove water stains from the finish, including #0000 steel wool, rottenstone, pumice, and 600-grit wet-or-dry sandpaper. Adventuresome refinishers have even used toothpaste or cigar ashes as abrasives. The depth of the stain will determine which one will work for you. Start with a mild abrasive. If that doesn’t work, go to sandpaper. However, the less cutting into the finish to remove water stains, the better. Rub #0000 steel wool over the stained area of the finish, rubbing with the grain and using firm pressure. If the stain is shallow, this may remove water stains. If not, go to Step 2. Use 600-grit wet-or-dry sandpaper and a felt block to sand the stained area if steel wool doesn’t get the stain out. A little soapy water or mineral spirits will work as a lubricant for the sandpaper. Use firm pressure and sand the area well, rubbing in the direction of the grain. If the stain doesn’t disappear, go to a coarser wet-or-dry paper (500- or 400-grit), but remember that coarser papers may dull the sheen in the repair area and can even cut through the finish to the wood, so be careful. If you use a coarser paper, follow it by sanding with 600-grit paper to try to bring back the sheen. Rub out the finish using #0000 steel wool and paste wax, if it’s needed to blend the repair area with the rest of the finish. As a last word of advice, all these techniques require skill and a delicate touch. While I have posted these methods, I assume no responsibility if you damage a piece. Consult a professional and let them do the work. At the Antique Warehouse we can fix almost anything. If you like, send us a photo by email no larger than 100K, and we can estimate how much it will cost to have your piece looking great again.